Activists of the Shiromani Panth Akali Budha Dal Panjwan Takht at a dharna against the government failure to punish those guilty of the 1984 riots in Ludhiana on Thursday. — A Tribune photograph. The resignations of Mr Jagdish Tytler from the Union Cabinet and Mr Sajjan Kumar as Chairman of the Delhi Rural Development Board following threats and protests by the Congress allies in the United Progressive Alliance (UPA) over his indictment by the Nanavati Commission does not appear to assuage the feelings of the Sikhs in general and the riot victims in particular. Even the unconditional apology by the Prime Minister, Dr Manmohan Singh, on behalf of the government and his party over the 1984 riots in Parliament today is being termed as political face-saving than a sincere realisation on part of the party that what had happened in 1984 was tragic and unfortunate. The general secretary of the Shiromani Akali Dal-Badal, Mr Mahesh Inder Singh Grewal, pointed out that Mr Tytler had resigned only after pressure from the Opposition and the left allies of the Congress. “The Congress on its own appears to be unapologetic...had it been sincere, it would not have waited for the Opposition and its own allies to pressurise it to remove Mr Tytler from the ministry”, he observed. Referring to the apology tendered by the Prime Minister, Dr Manmohan Singh, in Parliament today, Mr Grewal maintained that although it was a relief that the Congress-led UPA government had confessed to the crime, the apology should have come from the Congress President, Ms Sonia Gandhi herself. “Because it is the Congress which had mainly been responsible for the killing of Sikhs in Delhi and other parts of the country following the assassination of Ms Indira Gandhi,” he said. “Dr Manmohan Singh’s hold and influence over his party is too well known,” he added. Meanwhile protests against government inaction on the recommendations of the Nanavati Commission report continued today too. Activists of the Shiromani Akali Dal, led by the party vice-president, Mr Amarjit Singh Bhatia, staged a protest demonstration and burnt an effigy of the Congress president, Ms Sonia Gandhi. Mr Bhatia alleged that the Congress was trying to “shield” the guilty and had made Mr Tytler resign only because of outside pressure. The Shiromani Panth Akali Budha Dal Panwan Takht also held a demonstration against the government inaction. The Dal leaders, Jathedar Kulbir Singh Khalsa and Mr Roor Singh, demanded that the guilty of 1984 riots must be punished. They alleged that the Congress government at the Centre was also trying to protect the accused. The Bharitya Kisan Union (Punjab) leader, Prof Manjit Singh Kadyan, said it was quite unfortunate that the UPA government at the Centre was not initiating action against the accused. He expressed surprise as to why the Congress-led UPA government was reluctant to take action against those who had been indicted time and again by various inquiries for their involvement in the riots. Sikhs will observe protest on August 15 across the world. Some organisations representing Sikhs said here today that they were traumatised by the Nanavati Commission Report and the “so-called action taken report” of the Congress government. The Punjab Rights Forum, a conglomerate of various Sikh organisations, condemned the “sadistic approach” of the congress-led UPA government. It appealed to the Sikhs all over the world to observe August 15 as “protest day”. It said: “The Sikhs all over the world should not participate in Independence Day celebration. Sikh children should not go to schools to participate in Independence Day celebrations. Sikh men should wear a black turban and the Sikh women, young and old, should wear black duppattas. Sikhs reside should hoist black flags to observe August 15 as protest day”. The front members said: “We are particularly shocked at the un-Oxford like verbose lecture in Parliament of the Indian Prime Minister. The official response of the present UPA government is hogwash. The soft-pedaling by Dr Manmohan Singh, the dilly-dally approach of the Congress and the empty kind words of the Indian Prime Minister are symbolic of what has happened so far. We have had enough of such words, which do not mean anything”. The ‘allurement’ of employed turned a nightmare experience for 16-year-old Sigren, who was sold off for Rs 1,800 four years ago. He was again “purchased” by a farmer in a village in Phillaur. He was made to toil day and night on the promise of payment, was not allowed to make calls back home and was beaten up twice by the police when he demanded money for his services. He was rescued by the Dalit Dasta Virodhi Andolan, an NGO based in Phillaur, which has now arranged for his stay at its rehabilitation centre and has also taken up the matter with the Jalandhar police. “Four years ago, Sigren, who was 12 then was brought by one Mattoo along with five other children to Punjab. The person who brought him took Rs 1,800 from another person and the same day he was “purchased” by a farmer in village Khanpur in Phillaur,” alleges Ms Gagandeep, legal adviser of the NGO. “He said he would get us a job,” says Sigren, who hails from Jharkhand. Sigren says he wanted to go home and contact his family but was not able to do so as his employer took away the phone numbers from him. “I tried to call my family twice, but he came to know and snatched the numbers. He did not give me any money. When I demanded money and also told him I wanted to leave, he called the police who beat me up,” said Sigren. After three years and 10 months, he was allowed to go home and the employer paid him only Rs 12,000 (nearly Rs 260 a month). “He told me he would give me the remaining sum when I came back, but he did not pay me anything after I returned. It was around four days ago when volunteers of the association learnt about Sigren and found him working in the fields. “We rescued him from there and have now requested the Jalandhar police to investigate the matter. Not only do such people need to be booked, Sigren needs to get justice, be paid his wages and rehabilitated,” said Mr Gagandeep. The association is trying to search the other five children who were “illegally” brought here. The local police has booked two persons, including an SAD leader, for allegedly interfering in the official duty of the DTO, Sangrur, and manhandling his securitymen. One of them has been arrested. The suspects and the securitymen had a scuffle on the issue of shifting of four buses belonging to a college and a school to the police station as these had been impounded by the DTO. The wife of the SAD leader accused the staff accompanying the DTO of beating her husband after entering their private room and damaging household goods. According to Mr Rachhpal Singh, DSP, Malerkotla, Samsher Singh, a driver and resident of Barudi village, and Jagroop Singh, an SAD leader and dhaba owner of Phallewal village, were booked under Sections 353, 186, 323 and 34 of the IPC. Mr Amandeep Bansal, DTO, Sangrur, had reportedly impounded four buses belonging to Guru Harkrishan College and Guru Harkrishan Collegiate School, Phallewal, for running without any permit. “When my staff tried to shift the buses parked at Modern Dhaba at Phallewal, Samsher Singh, driver of one of the buses, and Jagroop Singh manhandled them and used derogatory language for me,” said Mr Amandeep Bansal to the police. On the call of the transport officer, a police party, headed by Mr Harjinder Singh, SHO, reached the spot and facilitated the shifting of buses to the police station. The family of the SAD leader on the other hand other accused the securitymen accompanying the transport officer of manhandling the family by entering their house forcibly and taking away the buses forcibly that had been parked by the owners. Mr Sukhdev Singh Walia, president of the college, and the Truck Operators Union Ahmedgarh alleged that the transport officer had concocted a story to conceal the misdeeds of his staff. “As they had no right to check the documents of parked vehicles, the DTO concocted a story that lead to the bitter situation,” claimed Mr Walia. He alleged that the Transport Department was trying to pressure the transporters to pay more bribe. Meanwhile, SAD leaders of the area have criticised the incident and demanded cancellation of the case. Mr Jagdish Singh Garcha, MLA, Mr Gurcharan Singh Grewal, president, All-India Sikh Students Federation, and Mr Tapinder Singh, a youth leader, criticised the alleged victimisation. The grounds of Government College for Boys, are ringing with sounds of patriotic songs as more than 2000 students practise for the Independence Day celebrations on August 15. The Health Minister, Punjab, Mr Ramesh Dogra will take the salute . The function on August 15 will begin at 8.55am with a march past by the police, NCC, Scouts and Guides. Mr Dogra will take the salute after inspection. A police brass band will accompany them. A mass PT by 1,200 children from 40 schools will follow. The students unmindful of heat and humidity are practising hard. After the PT, a cultural show would take place. Students of Sargodha National Senior Secondary School will perform a dance on ‘Jad gori sarkar hil gai. It will be followed by a performance by the girls of Ramgarhia Senior Secondary School. The other schools participating are Government Senior Secondary School, Gill, Nauria Mal Jain Senior Secondary School, RS Model School, DAV Public Section School Phulanwal. Students of these schools along with their teachers, come every morning to the college to practise. Bhangra and giddha will also take place. The Deputy Commissioner, Mr Anurag Verma, will give away awards to the toppers of classes X and XII of the CBSE. Also sewing machines and tricycle to physically challanged people would be given. 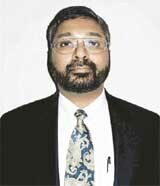 Dr George Abraham, Associate Professor of Medicine, University of Massachussets, USA. Having studied and served at Christian Medical College and Hospital, do you find any difference now from the time you were here ? CMCH was my alma mater from 1983 to 1995. There is marked improvement in all fields like infrastructure, practice of medicine and skilled manpower. The diagnostic facilities and procedures have undergone a sea change. Since you specialise in infectious diseases, are you satisfied with the measures being taken in hospitals to check infection ? The instances of infection within the hospital during treatment have been on the decline. Procedures like scrubbing, handwashing and isolation areas for patients of contagious diseases are being properly maintained in the hospitals here, particularly in CMCH. Do you feel that the medical facilities in India are comparable with those in developed countries ? Going by the parameters of skilled medical professionals and diagnostic facilities, the medical services are very much comparable to the best in the world. It is only lack of adequate resources and institutional support where the country lacks in providing medical care. A living example of this callousness is 45-year-old Dhuni Parsad Verma, who settled in the city about two decades ago. He has been running from pillar to post for the past one year to get back his belongings which the Ludhiana Municipal Corporation had seized while vacating his nine-member family from their accommodation in Model Town Extension. Though physically challenged Dhuni Parsad had been doing cycle repairs to feed his seven children. But when the MC swooped down upon his brick hutment, the men took away everything, including four benches, an LPG cylinder, two tables, a wheel-repair machine and 10 iron sheets, among other things. Since the MC men would not return his belongings, he filed a suit in a local court which directed the MC on August 8 last year to return the seized goods and also pay a compensation of Rs 25,000 for causing damage to four wall clocks, two beds, two transistor radios, two table fans and a TV set, among other things. After dilly-dallying for about six months after the court orders, Mr Dhuni Parsad says the corporation officials offered him Rs 7,000 for signing an out-of-court settlement, but he declined. Prominent among those present on the occasion were Mr Munish Tiwari, Secretary, AICC, Mr Malkiat Singh Birmi, Chief Parliamentary Secretary, Jails, Mr Sukhbinder Singh Sarkaria, Chairman, Punjab Mandi Board, Mr Harminder Singh, President, DCC (R), and Mr Dimple Rana, President, District Youth Congress. Speaking on the occasion, Mr Tiwari said during the coming years, the Congress government headed by Capt Amarinder Singh was all set to usher in a new era of prosperity and development in the state. He said during the past three years, the government had been able to put on the rails the shattered economy of the state. During this year, funds amounting to more than Rs 10000 crore had been arranged for development and welfare process. He said the state government was fully committed to safeguarding the interests of farmers and weaker sections. It had ensured smooth purchase of crops of farmers without corruption and harassment. He further claimed that the government had protected the riverwaters of Punjab by passing a legislation in the Assembly to abrogate all water agreements with other states. Criticising the SAD- BJP parties for their communal policies, Mr Tiwari claimed that their’s was the lone secular party which was struggling hard to strengthen the bonds of communal amity among different communities. Mr Birmi asserted that with the nomination of the new Chairman, the process of development in Punjab would be further accelerated. He pointed out that the government had provided eight hours of uninterrupted power supply to farmers for sowing paddy, even by purchasing power amounting to more than Rs 2000 crore from other states and the crops of the farmers had been purchased without any delay, whereas during the SAD-BJP rule, the farmers had to pay bribes and spend many days in mandis. He further informed that the state government had chalked out a prestigious programme to develop modern villages with all facilities available in cities and during this year, 234 villages — two in each block — were being covered under this programme. He appealed to the people not to be misled by the “false” propaganda of SAD leaders, who had done nothing for the farmers and welfare of weaker sections. Mr Sarkaria informed that the Punjab Mandi Board had implemented a programme to repair all link roads in Punjab and till June 30, 17000 km of link roads had been repaired and 4300 km more link roads were being repaired during this year. Others present on the occasion were Mr Jaswinder Singh Sandhu, President, Market Committee, Sahnewal, Mr Ramesh Kumar Pappu, President, Municipal Committee, Sahnewal, Mr Swaran Singh Sandhu, Vice President, Municipal Committee, Sahnewal, Mr Darshan Singh Birmi, Mr Dharamjit Singh Khera and Mr Parminder Singh, Secretary, Zila Parishad. Mr P.D. Sharma, president of the chamber, said here today that the investment limit for SSI was still Rs 1 crore except for few sectors where it was Rs 5 crore. The bulk of the bank credit would flow to the medium sector and only a marginal amount would come to the share of small scale units. The government has announced a number of times that the investment limit for the small-scale sector would be raised to Rs 5 crore . The enhancement of limit should have come simultaneously with this package. Mr Sharma pointed out that the parliamentary committee on industry had almost finalised the provisions of the small and medium enterprise Bill — 2005 and this committee had emphasised that the interest rate on small-scale unit should not be more than 8 per cent. The RBI had drastically reduced the bank deposit rate but on the lending side the RBI was silent . The small-scale units were getting bank credit at the rate of 2 per cent on PLR (prime lending rate) whereas large units were getting bank finance at very low PLR level.